February 7, 2012 - On Monday Boeing shares fell on the New York Stock Exchange after the aircraft maker reported it will need to take corrective action on the 787 Dreamliner carbon-composite fuselage support structure. The first Boeing launch customer, All Nippon Airways took delivery of the 787 Dreamliner on September 25, 2011, at Boeing's facilities in Everett, Washington. On September 27, the Dreamliner flew to Haneda Airport. 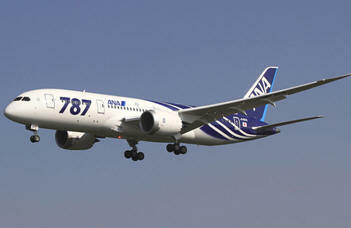 The airline took delivery of the second 787 on October 13, 2011. The Boeing 787 contains approximately 35 short tons of carbon fiber reinforced plastic (CFRP), made with 23 tons of carbon fiber. Carbon fiber composites have a higher strength-to-weight ratio than traditional aircraft materials, which helps make the 787 a lighter aircraft. Composites are used on fuselage, wings, tail, doors, and interior. Boeing had built and tested the first commercial aircraft composite section while studying the proposed Sonic Cruiser nearly five years before the Bell Boeing V-22 Osprey military transport which uses 50% composites, and the company's C-17 transport has over 16,000 lbs of structural composites. Composite materials are made by combining materials such as carbon fibers with epoxy, they have been used in airplane components for decades. Although composites are lighter and stronger than most metals, their increasing use in commercial airplane structures such as the fuselage and wings has raised safety concerns (The GAO Raises Safety Concerns Over The Boeings 787). Carbon fiber, unlike metal, does not visibly show cracks and fatigue, which has prompted concerns about the safety risks of widespread use of the material the rival Airbus A350 was later announced to be using composite panels on a frame, a more traditional approach, which its contractors regarded as less risky. In addition, the porous properties of composite materials, which may cause delamination as collected moisture expands with altitude, is a potential issue. Delamination is a mode of failure for composite materials. Modes of failure are also known as 'failure mechanisms'. In laminated materials, repeated cyclic stresses, impact, and so on can cause layers to separate, forming a mica-like structure of separate layers, with significant loss of mechanical toughness. Boeing has responded by noting that composites have been used on wings and other passenger aircraft parts for many years without incident, and that special defect detection procedures will be instituted for the 787 to detect any potential hidden damage. In November 2001, DOT issued an Emergency Airworthiness Directive as a result of an Airbus Model A300 B4-605R airplane?s vertical stabilizer which was made from composite materials separated from the aircraft on take off from John F. Kennedy International Airport. Upon inspection the rudder was found separated from the vertical stabilizer. On November 12, 2001, about 9:15 AM, American Airlines flight 587, an Airbus A300-605R, N14053, crashed into a residential area of Belle Harbor, New York, shortly after takeoff from John F. Kennedy International Airport, New York. Flight 587 was a regularly scheduled passenger flight to Las Americas International Airport, Santo Domingo, Dominican Republic, with 2 flight crewmembers, 7 flight attendants, and 251 passengers aboard the airplane. The airplane's vertical stabilizer and rudder separated in flight and were found in Jamaica Bay, New York about 1 mile north of the main wreckage site. All 260 people aboard the airplane and 5 people on the ground were killed, and the airplane was destroyed by impact forces and a postcrash fire. Visual meteorological conditions prevailed at the time of the accident. The National Transportation Safety Board determines the probable cause(s) of this accident were in-flight separation of the vertical stabilizer as a result of the loads beyond ultimate design that were created by the first officer's unnecessary and excessive rudder pedal inputs. Contributing to these rudder pedal inputs were characteristics of the Airbus A300-600 rudder system design and elements of the American Airlines Advanced Aircraft Maneuvering Program. Rep. Hirono Introduces ?Airline First Responder Workplace Fairness Act?